Bees are among the most important species responsible for pollinating about one-third of the world's food supply, with their contribution in the United States alone valued at $15-20 billion each year. Rapid declines in honey bee colonies globally, and in the United States specifically, have put increased strain on agricultural pollination and the future of food security. Parasites form one of the factors affecting bee population declines, with Nosema ceranea and Nosema apis being some of the most common. Nosema apis infection can have the symptoms of dysentery and defecation of honey bees at the entrance of the hive, but Nosema ceranae infection does not show any physical symptoms. This 'silent killer' of honey bees infects worker bees, drones and queen bees, and may even result in colony collapse. Currently, the only approach to diagnose this disease accurately is through the detection of parasite spores using a light microscope. However, this traditional testing is performed in laboratory settings and requires expert operation. Therefore, a beekeeper must send local samples to a remote laboratory for accurate diagnosis, which is time-consuming and expensive. Researchers at the UCLA Samueli School of Engineering, in collaboration with the Department of Biology at Barnard College, have developed a mobile-phone microscope that enables rapid and automated detection of Nosema spores in honey bees in field settings. This mobile and cost-effective platform, weighing only 0.8 pounds, is composed of a smartphone based fluorescence microscope, a custom-developed smartphone application and an easy to perform sample preparation protocol that enables fluorescence tagging of bee parasite spores even in the field. Aydogan Ozcan, UCLA Chancellor's Professor of Electrical and Computer Engineering and the associate director of the California NanoSystems Institute at UCLA led the research in collaboration with Jonathan Snow, an assistant professor at the Department of Biology at Barnard College (NY), and Hatice Ceylan Koydemir, a senior research associate at UCLA. The study was published in Lab on a chip, a journal of the Royal Society of Chemistry (UK). Disease diagnostics by this new platform involves sample preparation, where honey bees gut tissue is removed and midguts dissected, followed by adding a tiny amount of a stain to fluorescently tag parasite spores. A drop of the prepared solution is then placed on a glass slide, which is then inserted into the mobile-phone microscope for analysis. An image of the sample is then captured by the smartphone and transmitted to a computer for automated analysis to quickly reveal the spore count, which is sent back to the user in less than 90 seconds. 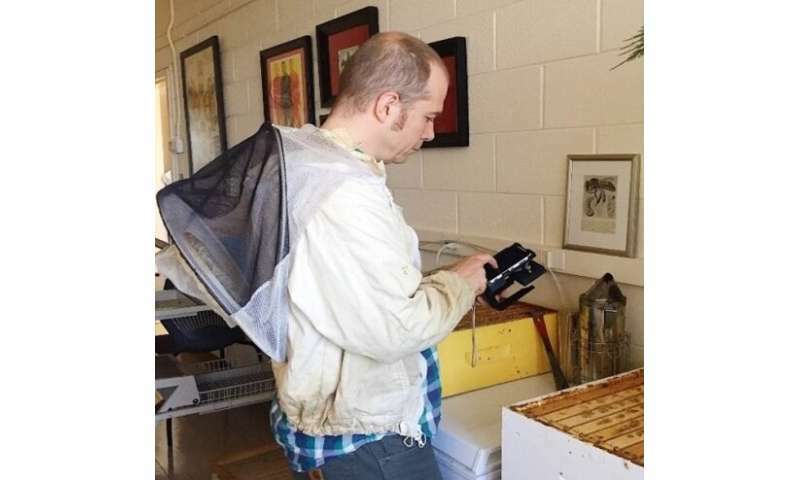 The researchers tested the performance of this mobile platform using field samples and determined that the device is capable of detecting the parasite concentration per bee that is below the threshold needed to advise treatment against Nosema parasites. Therefore, this mobile-phone based instrument meets the required detection sensitivity for establishing the treatment. "Ensuring the wellbeing of bees is a very important problem for global food security and ecosystem stability. There are many factors affecting rapidly declining bee populations, with parasitic infections playing a significant role. The developed mobile device paves the way to address this emerging problem in an inexpensive manner, and, to our knowledge, it is the first and only existing portable platform for Nosema spore detection in field settings." said Ozcan. The study was supported by the North American Pollinator Protection Campaign, a National Science Foundation Engineering Research Center (ERC) and the Howard Hughes Medical Institute (HHMI). The surge in these mites occurred because they stopped using pesticides and herbicides. By the time the green crusaders realize this, bees will have been nearly wiped out. They're not vulnerable to pesticides, far less herbicides. Not yet, apparently. I've no idea how long it will take, either. You'll have to keep your eyes open. The Smallest 400x Microscope for Smartphone!